hear what other women enjoy! One of my biggest fears is losing my little one to SIDS. So, when registering I was sure to put this on the registry. 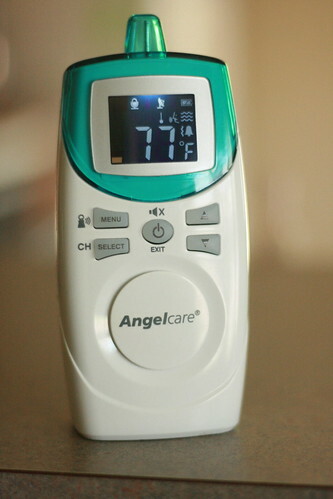 I was very excited about getting it and has helped me sleep better at night. 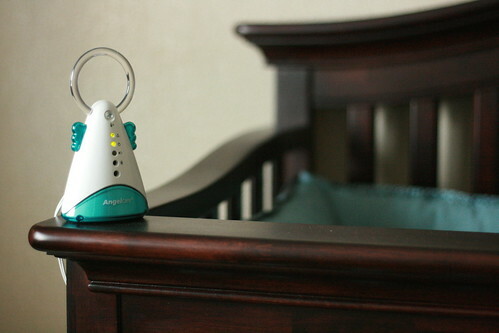 It's a movement sensor that is placed under the mattress and will sound an alarm if the baby stops breathing. We get asked a lot if it works and the short answer is yes! When little man was a newborn we'd lift him out of the bed forgetting to turn off the sensor and off went the alarm!! There was a few times that we'd lift him out forgetting the alarm and it wouldn't go off. I thought it was broken but come to find out our ceiling fan was on too high and it was sensing the movement of air. Once we turned down the ceiling fan it started working again. It's that sensitive! The company has 3 different sets to choose from. Mine has a sound monitor with 2 receivers. Mine will sound the alarm if there's no movement, if the temperature of the room is too high or too low, if it's out of range or if the battery is low. Here is the picture of the on and off switch/alarm for the sensor. This is connected to the actual sensor under the mattress. Here is a close-up of the receiver. It even has a mute button! Now it's your turn! Share with us your favorite thing! Thanks for sharing! I was wanting a video monitor, but have decided after yours and some other reviews that this is going to be my choice! And- good tip on turning it off before you pick them up. I probably would have freaked out! Wow, this looks like a wonderful product!! I just added it to my registry, thank you!!! !